Students, faculty, staff, alumni, and friends gathered Saturday, December 6 to remember their friend, William C. Placher, who died November 30. Alumni may view a podcast of the memorial service on the Wabash iTunesU website. The College has also posted on the iTunesU site a podcast of the Sphinx Club Chapel Service held December 4, as well as a number of Professor Placher's speeches. Click on the links to the right to read tributes written by Professor Placher's former students and colleagues. 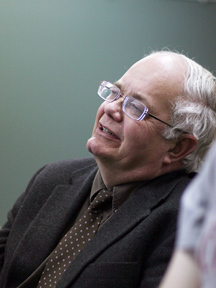 Placher was the LaFollette Distinguished Professor in the Humanities at Wabash. A 1970 Wabash graduate, Placher earned his master’s degree and Ph.D. from Yale, returned to Wabash to teach in 1975, and had taught and advised Wabash students for 34 years. The memorial service was almost entirely outlined by Professor Placher. His classmate and colleague David Blix played hymns he selected on the organ; Raymond Williams, LaFollette Distinguished Professor in the Humanities Emeritus, will gave a eulogy; his faculty advisor, Hall Peebles, gave the invocation; and Placher’s own pastor, Rev. John Van Nuys of the Wabash Avenue Presbyterian Church, gave the sermon. Other participants included Wabash President Pat White, Dean Gary Phillips, Chairman of the Board Stephen S. Bowen, Political Science Professor and Chair of Division III Melissa Butler, and two students, Justin Bilby ’09 and Jacob Stump ’11. The Wabash College Glee Club also performed. As a scholar of Christian theology, Placher had few peers. He was the author of 13 books and editor or contributor to literally dozens of others. He was a contributing editor to Christian Century magazine, and served as president of the advisory committee of the Wabash Center for Teaching and Learning in Theology and Religion. Pursuant to Professor Placher's wishes, memorial gifts may be made to Wabash College, care of the Advancement Office.